The inland of the districts Pandawai and Kahungu Eti are dry except the valleys. On the mountains pure craggy rocks are exposed. Only in the southern hilly area it is green and there are some villages. There are hardly any roads that deserve their name. Usually there are unpaved ways between the few villages. Regarding the landscape, there are very attractive areas in the south. Many things are still unexplored. The largest sugar cane plantation of Sumba is currently being built inland from Wanga. The water comes from deep wells or is branched off from the few rivers and stored in huge reservoirs. Computer-controlled it is then allocated to the plantings - a gigantic madness - you should look at this. At the coastal plain southeast of Waingapu it becomes soon significantly greener. In irrigated areas are rice fields, elsewhere there are soon some plantations of coconut and Lontar palms. Just around the river meanders around Kadumbul there are beautiful white beaches. Otherwise, the coast is more rugged, until the beach of Melolo. There might be crocodiles please keep a safe distance to river mouths and mangrove areas. Melolo is the fifth biggest town and trading centre for the east of Sumba. It lies at the mouth of the river with the same name. In Melolo Savunese, Sumbanese and Muslims live peacefully together. The Japanese bunker relics north of the river are a remnant of the past. The landing stripe is a football place now, and the former command center in the colonial style is now a conference center of the evangelical church. Everything is going to pretty slow here. In the evening, riders meet on the beach for a ride and horse care. On Saturdays at low tide is horse racing on the beach. From Melolo, the roads go south to Baing and west via Kananggar in the mountains to places at the south coast, or via Kananggar and Taramanu back to Waingapu. From Melolo you can reach many traditional villages. All these villages are located in the fertile delta of the river. Villages, which are always mentioned in guidebooks, are Umbara, Pau and Tambahak. Pau is certainly the highlight, but there are numerous other villages, which are also very interesting. The route to all these villages begins at the Waingapu road, just before the bridge over the Melolo River, and leads directly past or into the villages. You do not need an Ojek - within several hours walking you will have passed a good part of the river delta. In all the villages you can see stone sculptures. Women produce woven goods, less often Ikat. The patterns vary from village to village. In Melolo near the Phone mast is a gallery where the weavers' cooperative offers their goods at fair prices. When you follow the road towards Baing, you will come to Rindi (Rende) and Praiyawang 7 km south of Melolo. There you see huge stone graves and the houses are bigger than in other places in Sumba. Here you can also see house walls made of buffalo skin. Ikat and woven goods are produced - not only for tourists. The village is situated above a beautiful green valley of the Pinduwahu (Watumbelar) river. Behind the river bridge the road leads up the river to Tamburi and some other traditional villages. The asphalt ends on the hills and after 30 km the road leads, via a plateau with a lot of small settlements, back to the main road in the Mangili district. Another road leads 200 meters past the river bridge downstream to the village Kayuri and other attractive traditional villages. You have particularly beautiful views of the valley from the hills on the south side of the river. The first big branch leads from Tanaraing to Tapil, a typical Bugis village. It is located in a shady grove of coconut palms. The beach is sandy but very shallow. The next two branches lead from Heikapatu to Pamuhung and Maumbuling and to small mangrove-fringed beaches. Nobody lives here, except a few fishermen and people who cultivate seaweed. 10 km north of the eastern tip of Sumba there are broad and white beaches again. Some roads lead there and some sandy paths lead further from beach to beach. At Kabaru a 10 km road leads directly to the sandy beach, the most eastern point of Sumba. 1 km north from there is the tiny village of Nusa and in front of the beach the tiny rugged island Nusa Manu. The people punt you there with a dugout. The water is calm and crystal clear thanks to a wide outside reef - ideal for snorkelling. Sun, palm trees and nothing else – a dream for people who want to escape from civilization ... but it is very dry. At Palanggay, the road leads cross the cane plantation which is under construction, to the nice little beach and fishing village of Tambaoma. From Mburukulu a 10 Km long road leads along some corn plantations to Teluk Undu bay. Only a few people live here. They cultivate seaweed. The beach is not very convincing. But you can get ferried to the tip of the Tanjung Undu peninsula with a spectacular beach. There is a lighthouse, and from there you can walk along the beach south for about 12 km. Some kilometres south of the lighthouse is a shipwreck. In early 2014, 68 refugees from Afghanistan and Syria tried to get with that thing to Australia. However, the engine failed, and they were stranded here. Certainly this was a shorter way, because due to the rigid refugee politics of Australia, the navy would have pushed them back in any case. The next road branches 1.5 km south of Mburukulu. 300 meter past a school it leads to the small sleepy fishing village of Maukawini (Maukawini means free translated village without women) with an apparently endless fine sandy clear water beach, which is protected by an outside reef. The way along the beach to the south ends at the Kaliongga River which is infamous for its crocodiles. Please do not cross this river at the estuary or further inland! Near Maukawini there are several ancient burial sites, accessible along sand paths. From the main road 2.5 km further to the south at Lambakara you reach the ancient burial ground Okawatu. You get there via dirt road towards the coast, and past a sugar plantation. With about 16 hectares it is the largest megalithic tomb area in Sumba. 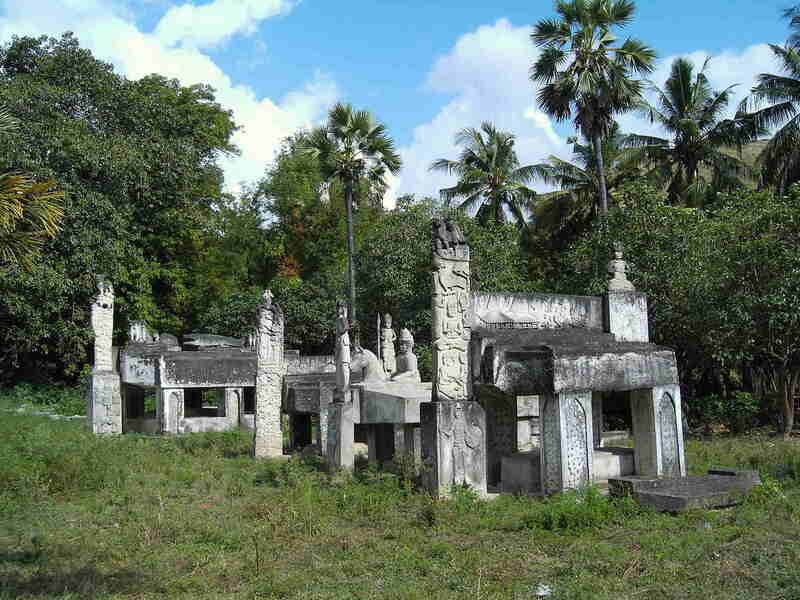 Many Rajas of the early period of Sumba are supposedly buried here. It is rumoured that also some sailors of the Magellan trip in 1522 found their final resting place here. The site is surrounded by a stone wall. Many graves are hidden in the thicket; many are no longer recognizable; many were opened in the course of time. Pieces of pottery testify to that. A little bit further you get onto the district of Mangili. This area is fertile and densely populated. The plain is irrigated. Along the main road there are numerous small villages with megalithic tombs, most of them decorated with colourful ornaments and figural representations. About half of the villages are Christian. If there are no crosses on the graves, it can be assumed that it is a Marapu village and you should be very careful when entering. Many Roads branch eastbound. The southernmost road leads directly to Kaliuda. The place is famous for Ikat. At many houses, women can be seen working on it, and the looms are often stretched in front of the houses. Kaliuda has 2 beaches. The northern beach Hangaruru can be reached when you turn 300 meter north of the mosque always towards the coast. The beach is no longer suitable for bathing, because everywhere seaweed cultures are floating on the shallow water, bound to plastic bottles. The coconut forest behind the beach provides a lot of shade. On the southern cliffs there is a nice shady beach path to the neighbouring bay and the southern beach Benda (Laindunga). This southern beach is also accessible via the road, which branches off at a curve near the Luanda River Bridge. The road ends at the mouth of the river Wuluwamu. The beach is protected by a reef, the water is crystal clear. Also here is much seaweed cultivation and the beach is only partly suitable for bathing. Via the river mouth you get to the southern part of the beach. There a path leads back to the main street. South of the Mangili district a road branches off to the mountains. It passes the new settlement Kuruwaki and ends in Lulundilu or Haray (Hararo). Thereafter, actually only the northern road is drivable. It starts before the river bridge and goes via Wairara onto the road Melolo Kananggar. The landscape is increasingly hilly and beautifully green with some secret lakes. There are great views of the southern and eastern coastal region. Along the way there are numerous small traditional villages. Straight ahead over the river bridge, an unpaved path leads over Lahiru to Kananggar, 20 km of adventure. The southern road turns off in the village of Lulundilu and goes via Haray (Hararo) and Lahiru to Kananggar. The road up to the summit is newly asphalted. From a 600 meter altitude you can see the entire southern coastal region including the surf of Kalala. Then the road ends. If you continue the way it will be 20 km of adventure. The paved main road goes further just behind Baing. Buses from Waingapu end in Baing. The settlements at the coast around Baing belong to the village named Kalala (Kallala, Kalalla). Between Baing and Kalala there are numerous lakes. After the monsoon season they are filled to the brim. In the dry season they shrink to small ponds. Here flocks of migratory birds from Australia nest and breed. Where it is still green hundreds of water buffalo are grazing. Around the lakes, mazes of sandy paths lead to the coast. The coastline is surrounded by a far off riff. Between reef and coast, there is a super white beach. At high tide you can swim anywhere. You can get paddled to the reef with one of the old outrigger boats. This is an area for snorkelling. However, it is no longer as great as years ago, because the water has become dull by the increase of seaweed cultures and you will find only few fishes there. With increasing low tide, the current is quite strong. At low tide the villagers harvest their seaweed cultures here. You can also spend hours walking along the sandy beach. At low tide you can ride by motorcycle or horse along the beach. The 2 beaches Tundawai and Mengabiko (Menangaboro) northeast and outside the reef are good surf spots and are usually only accessible by motorcycle. Mr. David's resort is located on the south-western end of the reef. There is a steady wave for surfing and swimming. In 2012, the construction of port Baing directly south of the resort of Mr. David started. Ferries to Savu and Kupang should start here. But the waves stopped the project. Since Mr. David predicted that this will happen, this fragment is now known under the name "David's revenge" or "Dendam David". In Baing the road splits in 2 directions. The northern route leads through the village for a while, past imposing tombs and then meanders picturesquely through the deep green Baing River valley dotted with palm trees, past some traditional villages to Laipandak. From there you can only hike along the west side of the river perhaps up to Haray (Hararo).